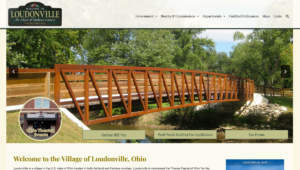 The Village of Loudonville has been a client of Henley Graphics for many years. We updated their site in Spring of 2018. We converted it to a WordPress site because they have several departments that require access to update their content, including the local government, Police department and the Fire department. We kept the design simple, emphasizing navigation. The website contains a lot information for public access and we planned it for ease of use in locating the relevant information in a few clicks.